Nice is a wonderful French Riviera city, and a popular destination for couples, honeymooners and sun-worshipers. It is a large city, though, and it can be tough mastering it. Find out all the basics of a Nice vacation, including what to do, what to see, where to stay, great day-trips and how to get around. 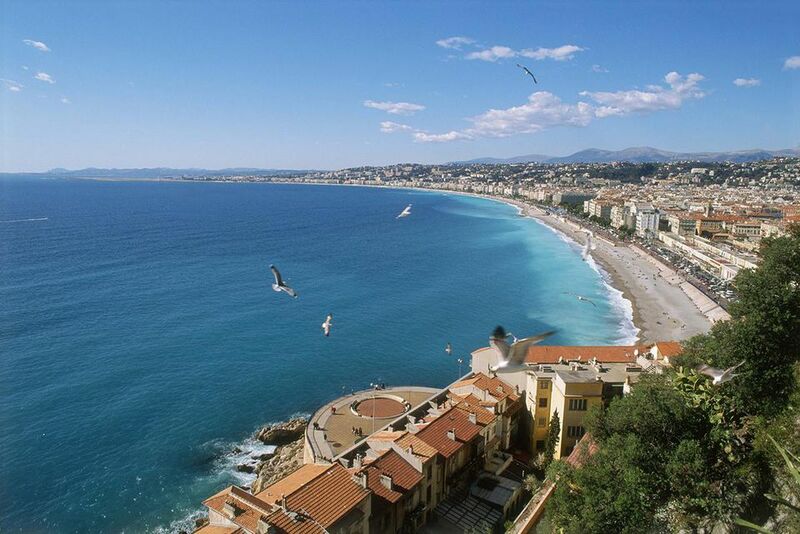 Nice is well-served by the Nice-Cote d'Azur airport just west of the city. It's an international airport, so there are flights from over 100 destinations, including New York. Check out my information guide on how to get from London, the UK, Paris and the U.S.A.
Read my guide to traveling from London to Nice by train in detail; it is a delightful journey and makes a great start to a holiday on the Cote d'Azur. There are numerous shuttle buses and local bus services to Nice and other Riviera cities, as well as overpriced taxis, to take you into the city when you arrive. If you are traveling by rail, Nice has three rail stations but you will probably arrive in the main terminal at Nice Ville. This will put you a few blocks north of the coastline. There are many connections from Nice Railway Station to other cities in France, and also to Italy which is a very short distance away. The major bus system in NIce is Lignes d'Azur which operates in the city and also to and from the airport and other nearby towns. They also operate over 130 bus routes in the 49 towns that make up the whole Métropole Nice Côte d'Azur area. There are other regional buses to nearby cities, and most stop at the Gare Routiere just north of Place Massena. There are rail connections to most neighboring cities as well, with the most frequent stops at the Nice Ville station. In Nice there is also the Noctambus which operates 5 night time bus routes from 9.10pm to 10.10 am, but they are not very frequent. There is also the tram. No 1, a 9.2 km line that goes from north to east and passes through the city centre along avenue Jean Medecin and through Place Massena daily from 4.25am to 1.35am. Buy a single ticket for on journey which also allows changes within 74 minutes for 1.50 euros and various other very good value tickets for different lengths of stay. You can obtain a system map and a brochure listing timetables at the tourism office on the Promenade des Anglais, or at the main bus station in the Place Massena. You can rent a car, but check first to see if your hotel has parking and what the cost is. It can be quite difficult, if not impossible, to park a car in Nice. If you are in Nice from another part of France by car, then consider leaving the car at one of the 5 'Parc relais' or stop-over car parks outside the centre. It's free to use and you can then take the tram into the city centre. There are countless things to see and do in this city, whether in the heart of town (Nice Centre) or in the hills that stretch behind the main city (les collines). The Cours Selaya Flower Market is a must-see. This is also one of the main neighborhoods for dining, with restaurants, cafés and bars lining the outdoor market. If you want seafood, this is the spot to hit. There are also several souvenir shops, gourmet shops and other boutiques here. Vieux Nice (or Old Nice) is right next to the market. Wander these narrow streets and discover great shopping, dining and some of the city's most happening bars. This is also a great destination after-hours, but go with a group. Old Nice is filled with dark alleys, and lone wanderers can become a target. Nice Cimiez, about a 15-minute bus ride from Nice Centre up into the hills, has a small concentration of museums and attractions. The Musée Matisse contains a wonderful collection of the great local artist's work. The archeology museum next door is interesting, but what is more fascinating is the ruins of the Roman amphitheatre, public baths and paved streets. The Promenade des Anglais is something anyone visiting Nice is sure to see. Even though they are outrageously overpriced, hit one of the seaside private beach/restaurants at least once during your visit. Rent a chaise lounge a few feet from the shore, and let waiters (usually unbearably slow and inattentive) bring you lunch and drinks. The Pedestrian Zone (zone pietonne) is a bit of a tourist trap, but there's a good reason. This is a lovely area for a stroll, as cars are forbidden except for the early morning hours (and the rogues who scoot through here anyway during other times). The shops here are on the tacky-tee-shirt scale in most cases, although there are several great clothing store chains and nice shops like the gourmet boutique Ducs de Gascony. This is the ideal spot to sip a café au lait and watch the world go by. There are countless hotels in Nice, and an unusually high number of four-star accomodations. But for a treat try the Hotel Windsor, a short walk to the beach and the pedestrian zone, and a slightly longer walk to the Cours Selaya and old town. The rooms are reasonably-priced, and the staff is the most helpful around. The rooms also have their own personality, most decorated by artists and unique murals. Be sure to request a room with a balcony. Read guest reviews, compare prices and book the Hotel Windsor on TripAdvisor. Read guest reviews, compare prices and book the Hotel Negresco on TripAdvisor. There are several great towns and cities near Nice, usually just a few minutes away. Check out the guide to the best day trips from Nice, a fabulous centre for the area. Here is a guide to a 3-day itinerary in and around Nice.